As a novice welder, you might be confused over the best beginner MIG welder to settle for. With the availability of vast MIG welders in the market, it is crucial to be well informed on the necessary features and application of the machines. To achieve great results in welding, you need to be in possession of quality raw materials, a welding machine and safety equipment. One should evaluate needs according to the intended use of the machine whether for household or industrial use. It is important to give notice to the market trends of the users in order to determine the most popular and quality machines. 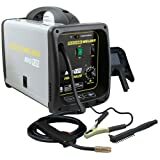 To assist you make a decision on the best MIG welder to use in your home shop, we have a list of three quality welders. These provide a variety of options on the metals to weld and even on the size and thickness of the wires. They may be for outdoor or indoor use depending on your needs. Weighing only 53lbs the Auto Arc 130 is ideal for outdoor use. It is small in size and portable. It serves best for your lawn furniture projects, the fence repairs, small home repairs and mower deck welding. This machine provides a rare opportunity to produce very strong welds at a 115v household socket. The Auto Arc 130 is fitted with a durable feed head and dual groove release drive roll lever that enables it to weld twenty four gauges up to 3/16 inch mild and stainless steel.This pushes the wires quite well producing quality welds. You can use this equipment with or without gas, rendering it very flexible. This welder does not heat up, therefore it can be used continuously without interruptions making it very efficient and fast. 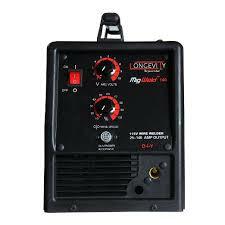 For a novice welder, the machine is very easy to set up and use. A setup user guide is provided on the inside. A sample spool core wire and three replacement tips are availed by the manufacturer. If you are into welding for a hobby, this is the best selection for you. If you require to weld much heavier projects such as auto body, farm and household repairs that require more power, the Handler 140 is a perfect choice. Operating at 20 amps and 115v household current, this welder is fitted with a 5-position tapped voltage control selector which enables you to produce smooth welds on all thicknesses up to ¼ inch. The machine is built with an industrial cast aluminum system making it appropriate for industrial performance. The handler 140 is easy to transport and, therefore, can be used whenever needed. It weighs only 57lbs. The skill levels required to operate it are low since it is fitted with a user guide for ease of operation. This welder is very versatile and efficient because of its high speed and the high quality of welds that result from its use. A sample spool makes it ready to use soon after purchase. 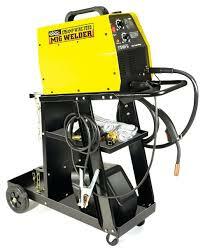 This is a perfect welder for use in light to medium sized jobs in the farm or the house. It is quite flexible since it can get into any small or difficult to access space with minimal splatter. It’s conducive to use with a wide range of metals and alloys. With a duty cycle of 20% the flux core welder can operate continuously when heated up without the need to stop and cool down. It is very fast and welds up to 18 gauge up to 3/16 inches. This flux core welder is convenient and easy to use because it comes with all necessary accessories needed such as spool flux core wire, face shield and brush. 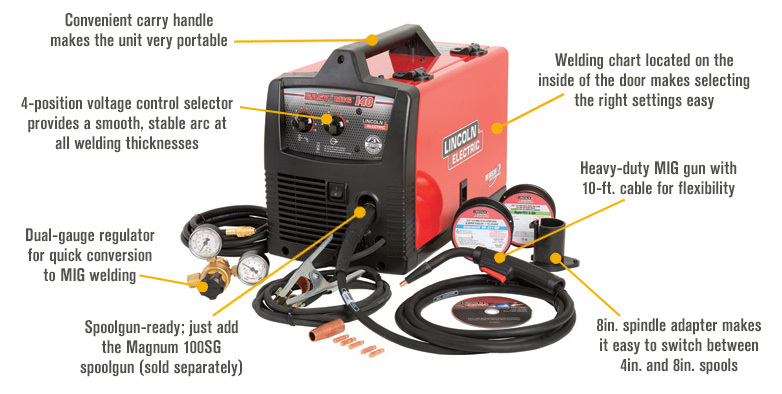 If you operate in more than one location, the flux core welder is the one for you. With it weight at 40 lbs., it is easily transported to a desired location with ease. This welder operates from a standard 120v outlet, therefore, is sustainable for use with the medium sized jobs that would otherwise require a lot of power. 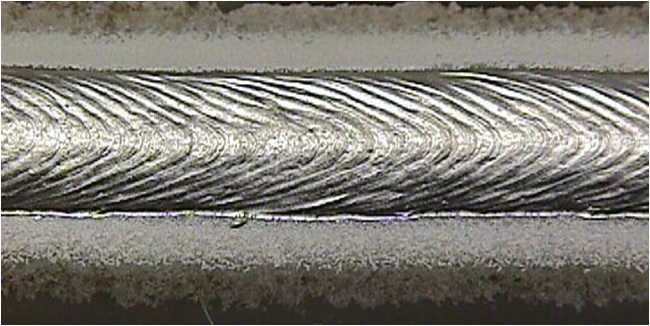 The machine produces very high quality welds.